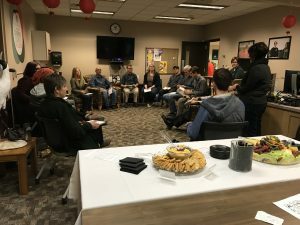 Supporting the Psychology department’s commitment to multiculturalism and diversity, we have initiated a monthly conversation about a range of diversity-centered topics that we are calling Diverse Conversations. These conversations are held over the lunch hour at BSU’s Center for Diversity, Equity, and Inclusion to provide easy access for students, faculty, and staff who are getting lunch in Hobson Union. One of the primary objectives of Diverse Conversations is to bring BSU community members together in conversations about critical topics of diversity and inclusion and to foster the normative expectation of culturally competent communication in the process. These conversations are open to anyone who wishes to participate. Diverse Conversations participants discussing the Language of Diversity in the CDEI.